Hydrogen truck company Nikola Motors announced today via Twitter that its upcoming Nikola Two and Nikola Tre would come to market in both a hydrogen and a battery electric build when they are unveiled at Nikola World 2019 next month. Much like the present, the future will not be black or white. As we look at technologies today, it is easy to dismiss one or the other because of how things stack up right now, in the moment, and our resulting expectations for the future. Hydrogen fuel cell vehicles often get a bad rap for not competing with battery electric vehicles today or in the foreseeable future. Nikola Motors has a bold vision for the future with its hydrogen — and now battery electric — heavy-duty trucks, which are helping to raise awareness about the importance of moving off of diesel trucks as the backbone of the logistics system that many of us rely on daily. The company’s bold vision for a family of fully electric hydrogen and battery powered trucks (with the network of hydrogen fueling stations generating hydrogen from renewables) is exciting and impressive. Having said that, lets not get lost in the details about hydrogen fuel cell versus battery electric vehicles and remember that we’re all on the same team here and every hydrogen fuel cell truck powered by renewables offsets just as much diesel emissions as a battery electric truck, even if it’s not as efficient. The Nikola Motors announcement that it will bring battery electric trucks to market in parallel to its hydrogen fuel cell trucks is great news. More options for more fleet managers. The new battery electric semi trucks will come to market in 500kWh, 750kWh, and 1MWh variants that would provide service on shorter routes, according to the company. The main benefits of hydrogen that the company is laying out is that hydrogen vehicles will be 5,000 pounds (2,270 kilograms) lighter than a comparable battery electric vehicle. Though, it’s not clear if this is fully filled or not. Hydrogen fuel cell vehicles should also be able to be refilled in a matter of minutes compared to the longer charge times of battery electric vehicles. This part of the debate is still very much in flux, as battery charging companies are already talking about and deploying 350 kilowatt charging stations and the compressed nature of hydrogen causes heating issues in the tanks when fueling, and freezing issues at the nozzle due to the high throughput — and that’s just on passenger cars. Translating that into range is somewhat more of a challenge, but Nikola Motors laid down some hard numbers in support of its claims. A fully loaded BEV semi truck with 80,000 lb uses 2.25 kWh per mile, for a max range on the 1 MWh configuration of 400 miles. Taking into account that only 90% of the battery should be used as well as potential impacts of weather results in a 300 mile range, according to Nikola Motors. That’s not a watertight spec sheet, but it gives us an idea of what Nikola has in store for its BEV offerings. Nikola Motors and CEO Trevor Milton went on to clarify in additional tweets that the addition of battery electric vehicles would not have any effect on its sales of hydrogen vehicles. Though, more detail is needed to truly understand how it will play out. If the company can deliver on a network of high-volume, low-cost-per-kilogram hydrogen fueling stations across the country, its vision for hydrogen fueled long-haul trucking may take form. The vision is bold, and with the sleeper cab, hydrogen-electric Nikola 1’s dual 120 kW fuel cell stacks are taking shape as the company works towards production in just 3 years time. 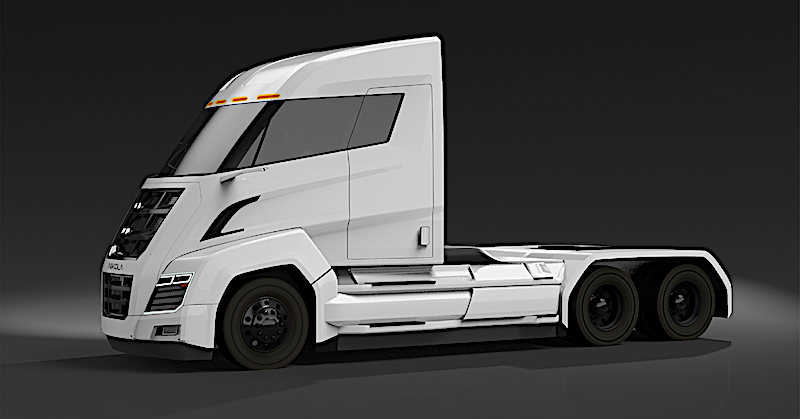 The Nikola Two trades down for a day cab that the company is building on a redesigned chassis. 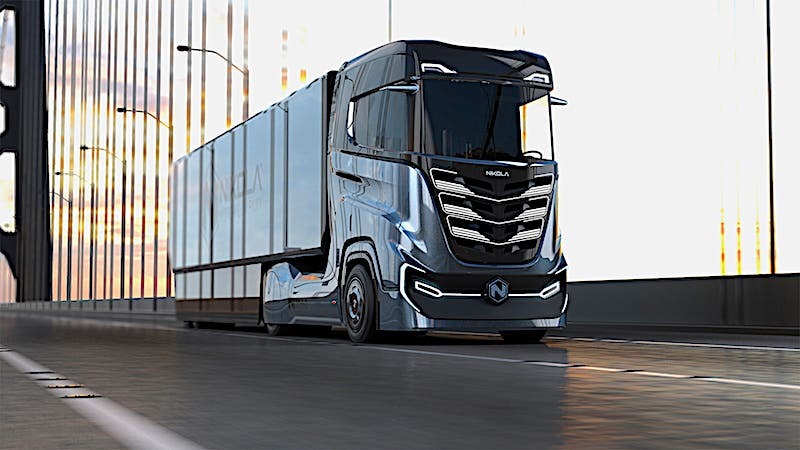 The Nikola Tre was designed for the European market, using a cab-over design that flattens the front of the semi and shrinks the footprint of the vehicle by situating the driver over the “engine” in accordance with European regulations. The backbone of the premise of Nikola Motors has always been its hydrogen fueling network, with more than 700 stations planned across the US and Canada that will operate at 700 bar (10,000 psi). The plan is to have the full network up and running by 2028, with a production capacity of 2,000 to 8,000 kilograms of hydrogen per day, depending on the station. The company has global aspirations. In parallel to its two US configurations, it plans to launch a hydrogen fueling network in Europe that will come online “around 2022.” The network will continue to be built out in the years following its initial launch, with coverage of most of Europe by 2030. Nikola Motors is currently working with Nel Hydrogen out of Oslo, Norway, for its hydrogen stations in the US, and given its base in Europe, it follows that the company would be first in line for the buildout of the European network as well. Time will tell if that pans out. To learn more about Nikola Motors, read some of our past coverage of the company, head over to its website, or follow them on twitter.